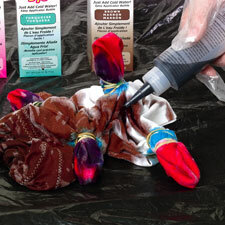 Create splatters of color across the fabric with the splatter tie-dye technique from I Love to Create. 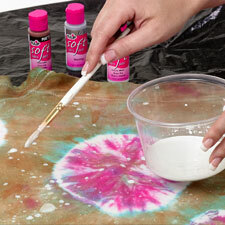 The splatter tie-dye technique is fun to try with friends and family. Create gifts for any occasion! 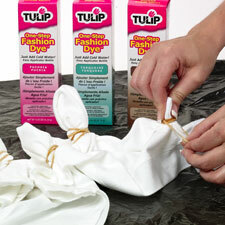 Before beginning a tie-dye technique or project, read the instructions for the Tulip Permanent Fabric Dye or Tulip One-Step Fashion Dye. Refer back to them for standard steps. 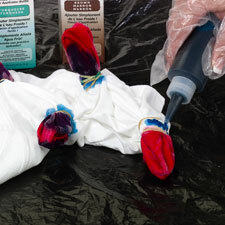 Before beginning, read the Tie-Dye how-to instructions and refer back to them for standard steps. Prewash shirt to remove sizing. Do not use fabric softener or dryer sheets. Cover work surface with a plastic tablecloth. Rubber band T-shirt with approximately 5 rubber bands, gathering a small section front and back together. Pull up and place a rubber band about 3” down. Wet T-shirt in water. 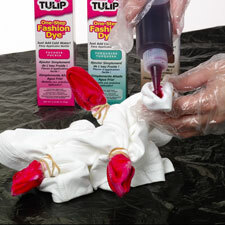 Fill dye bottles to the top with water. Shake until dye is dissolved. Apply Fuchsia to tip of rubber-banded section. Apply Turquoise on top of rubber band. Cover rest of shirt with brown dye. Cover shirt with plastic. Let set for 4 to 6 hours. Remove rubber bands. Fill washer to large load setting with hottest water suitable for fabric and a small amount of non-bleach laundry detergent. Wash and dry separately. 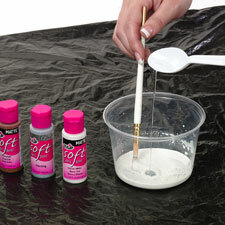 Mix 3 tablespoons Glacier White Soft Paint and 3 tablespoons Sterling Glitter in cup. Add 1 tablespoon water. Mix until blended. Place T-shirt face up on tablecloth. Dip paintbrush into mixture and splatter paint onto T-shirt in desired area. Let dry approximately 4 hours. Wait 72 hours to wash. Machine wash warm on gentle cycle. Do not use harsh detergents or bleach. Remove promptly and line dry. I might have to try this FaveCraftsTieDye method!